The Collins Co., along with its predecessors and when it operated under name variations, used a wide number of registered trademarks, trade names and proprietary brand names. They also produced goods that were specifically labeled with distributor names and brand names that belonged to specific distributors. Some identifying marks and labels included a reference to Collins while others did not. The sections identified with red titles address some of the trademarks, trade names and brands associated with Collins but it should be understood that there were many others. The dates refer to the time frame during which those identifying marks and names were used. Like many other manufacturers, Collins used a number of methods for identifying their products. The process of transferring pictures or designs printed on specially prepared paper to another smooth surface was one of those methods. The process was called decalcomania. It was invented around 1750 in France for use on ceramics and by the later part of the 1800s it had been adapted for use in numerous situations. A contributing factor to the wide spread use of decals was the invention of suitable paper that facilitated the designs to be moved from a paper backing to a solid smooth surface. Those decals were called water-dipped or water-slide decals. The larger rolls of decals were automatically wetted with water and the the decal was slid off the backing and onto the tool or tool handle. Decalcomania or "the craze for using decals" led to the common use of decals (as they are commonly known in the US, transfers in Britain). The thin substrate backing was attached to a heavier paper backing when printed and die-cut. Wetting permitted the decal to be transferred to another surface. This means of identifying tools was inexpensive and has remained popular for some applications even until today. Starting in the last quarter of the 1900s newer materials and techniques have seen decals substituted for the peel-and-stick labels. Representations of decals used on hatchets. Commander labels reportedly used by Truper Herramientas of Mexico on some axes sold through wholesale hardware and supply distributors. Decals used on some axe and hatchet handles. The one depicted at the bottom was quite late. On some labels the LEGITIMUS mark was the primary focus. On others it was combined with other information. Commander labels used by Collins Axe of Lewistown, PA. after 1966. This design was used on paper labels on some axes and on others it was stamped into the metal with the recessed areas painted gold. 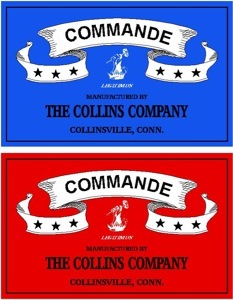 Commander labels used by the Collins Co. of Collinsville, CT. The COMMANDER brand was originally used by the Collins Co. in the earlier part of the 1900s. It appears to have been one of the brands supplied to distributors for them to sell to retailers. 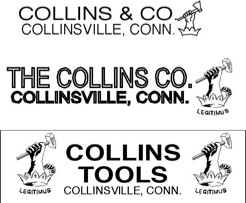 After Collins was acquired by the Mann Edge Tool Co. the label took on a new appearance without the inclusion of the Legitimus symbol. The design associated with axes made by Collins & Co. in Lewistown was included in the sale to Truper Herramientas in 2003 and by the early twenty-first century it became available in various hardware chains and big-box stores. The "company" is noted as Collins Axe. Representations of label, stamping and string tag used on or with Collins Bonded Axes. Axes identified with the stamping "COLLINS BONDED" were advertised as being the best that money could buy and were compared to being of the same status as a Cadillac automobile. Each new COLLINS BONDED AXE had a round label affixed to the blade and an identification card attached to the handle when it was sold. The term COLLINS BONDED referred to the method by which the head was affixed or secured to the handle. It is quite possible that the introduction of the COLLINS BONDED axe was to be competitive with the Permabonded handle system that was used for Plumb axes and hammers. The Red Seal label was printed in at least three different color variations, each with the words "Axes and Tools" in either red, black or blue. The name was also stamped on some axes. Registered June 18, 1929 as Trademark 257,798. Claimed to have been used since March 1, 1905. 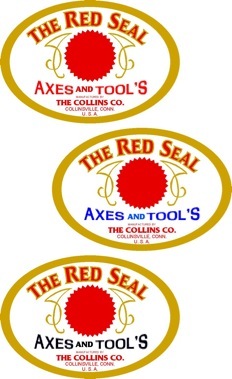 The RED SEAL label was printed in at least three different color variations, each with the words "AXES AND TOOL-S" in either red, black or blue. The mark between the L and S is unexplained. They also used stampings on axes with the same brand name. Note that the manufacturer's name included on the labels with the black lettering appears with two different names and locations. Some axes were made in Yeagertown, Pennsylvania, a community near Lewistown, Pennsylvania. They are marked JAMES H. MANN CO., LEWISTOWN, PA. That reflected the manufactory that Collins had acquired from James H. Mann, Jr. around 1923. 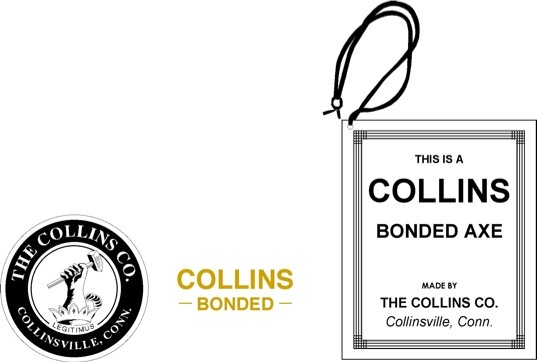 Some of the brands Collins used were printed on shield shaped labels. The brands shown were not necessarily as common as some of the other brands and apparently they were offered in wholesale hardware catalogs more that anywhere else. 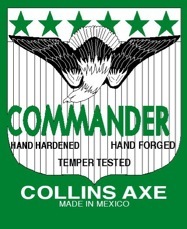 Collins used a number of brands on the axes they made. Some were advertised in wholesale hardware catalogs more than anywhere else. The oval shaped label was of a later design. Some early labels were modified and then used for an extended period of time. Although Collins & Co. marketed axes under the name OLD TIMER for a number of years there has yet to be any indication found that the name was registered to Collins. It may well be that the brand evolved from a brand acquired when Collins & Co. acquired the James H. Mann Axe. Co. of Pennsylvania. That was sometime in the early 1920s, perhaps as late as 1922. The OLD TIMER label may have been used from as early as the turn of the century until the 1960s. The earlier HOMESTEAD labels were quite detailed and used in at least two different sizes. Versions of both generation labels have also been observed printed in black on white paper and black and gray on white paper. 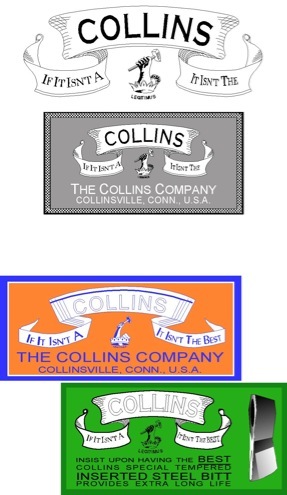 These versions were used in catalogs although Collins did use a variety of black on white labels over the years. The HOMESTEAD brand was used over such a period of time that the label design was modernized at some point, possibly during the late 1950s or early 1960s. That updating also resulted in some of the labels being printed in blue and white on gold colored foil as compared to the traditional paper. 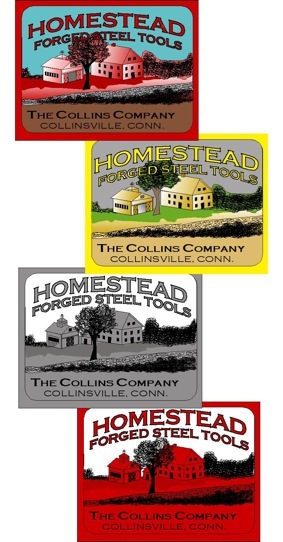 Labels bearing the HOMESTEAD brand were printed in a variety of colors and some in more than one size. The use of the banner by Collins in their advertising and on labels was wide spread. The design seems to always have included the Legitimus symbol. That symbol was commonly referred to as an "arm & hammer" but more correctly it was the "crown, arm & hammer". The banner design varied from application to application. In some situations it was more detailed while in others rather simplified. The colors varied as did the style of the lettering but all in all the design always had a similar appearance and became recognized as part of many Collins markings. In addition to the banner being used on goods and in advertising associated with English speaking markets, the banner design was used quite frequently used on labels and in advertising associated with export goods. In some cases it included some wording in Spanish and in some other cases Portuguese. In many situations the Collins banner design used for export trade included a banner design that was more detailed and embellished than when used in domestic situations. 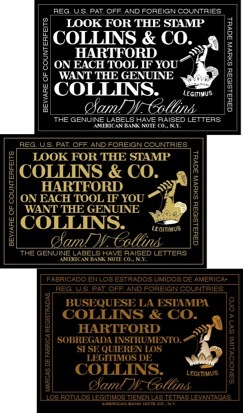 Labels with the COLLINS name were produced with a variety of wordings and color combinations. 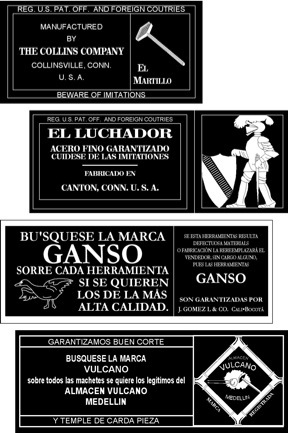 Examples of banners as used on labels and in advertisements in English speaking countries. Markings using Mexico as the location. 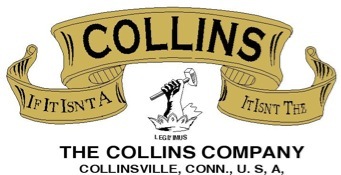 The original Collins Company and each of the companies that succeeded it as a result of reorganizations while Collins was in Connecticut made other tools in addition to axes. Generally speaking most of those tools can be described as edge tools, many of which were intended for agricultural use. Some were specifically designed for harvesting but perhaps the most famous agricultural tool was the plow which was made in a number of designs. Machetes and Bowie knives also accounted for a significant amount of Collins production and Collins made a wide variety of such edge tools between 1845 and 1965. Not only were machetes a primary harvesting tool used throughout the world they became widely used as weapons. Collins provided hundreds of thousands of machetes and what were called Bowie knives under their own labels as well as those they marked with the names and logos of other distributors and military organizations. Less common are Collins hammers and wrenches but they too were made at various times. As mentioned Collins also manufactured "other" edge tools and even shovels for some time. Some of the other edges tools refer to those tools used in various parts of the world for harvesting and other agricultural applications not common or inappropriate for use in North America. Quite frequently this involved the input and/or requests by agents, plantation operators and other special purpose users for Collins to make specialized tools. Apparently such requests were not uncommon to Collins as there were at least five substantial pattern books created to keep track of the special requests. The books were ledger size and contained page after page of full-size patterns generated from the sketches and drawings submitted to Collins from the prospective buyers. It is assumed that Collins did not make a practice of making one-of-a-kind tools but they may have made prototypes that were submitted to those requesting the special or customized tools. It is further assumed that these requests led to the purchase of a minimum number of tools representing those specific designs. Examples of markings used by domestic manufacturers. No such businesses bearing the names of such companies are known to have existed. Adding to the confusion are a few labels that were later used on axes actually made by Collins. Those axes with their respective labels were for companies located in England. It may well be that there was a business arrangement between The Collins Co. and the English companies represented that stimulated competition. It may also have been that the English companies had generated a reputation for their axes and wanted to continue it. Some examples were A. W. Wills and the Chillington Tool Co. both which were makers of edge tools. (Eventually they were merged into one company. )Another was Gerwin & Co., a maker for which little is presently known. It could be that in addition to manufacturers they were all exporters that had permits to deal where Collins did not have such permits. Another possibility is that they had a call for what was making a reputation as "The American" style of axe. As a point of clarification it should be understood that the name of the company is expressed in a number of forms. Initially the business was named Collins & Co. but that name was relatively short-lived lasting from 1826 until 1834. A problem originated from monetary difficulties and it was necessary to restructure the company under the name Collins Manufacturing Co. Apparently there was some infighting involved relating to discontent on the part of some investors referred to as the "& Co." portion of the organization. When they took over they discovered the name Collins Manufacturing Co. was not accepted by customers anywhere close to the degree that the name Collins & Co. had been accepted. An agreement was reached between the management and Samuel Collins (he owned the name Collins & Co.) that permitted the Collins Mfg. Co. to mark the goods Collins & Co.
Samuel remained as the superintendent of the works during the years between 1834 and 1843 after which he and his brother regained control over the company with the reorganized name becoming The Collins Company. The company technically remained The Collins Co. until it was sold to the Mann Edge Tool Co. in 1966. The use of the name Collins & Co. was continued in a number of situations resulting in The Collins Co. operating or at least being recognized as both The Collins Co. and Collins & Co. The original Collins & Company and each of the companies that succeeded it as a result of reorganizations while Collins was located in Connecticut, made other tools in addition to axes. Generally speaking most of those tools can be described as edge tools, many of which were intended for agricultural use. Some were specifically designed for harvesting but perhaps the most famous agricultural tool was the plow which was made in a number of designs. Machetes and Bowie Knives also accounted for a significant amount of Collins production. Collins made a wide variety of such edge tools between 1845 and 1965. Not only were machetes a primary harvesting tool used throughout the world, they became widely used as weapons. Collins provided hundreds of thousands of machetes and what were called Bowie knives under their own labels as well as those they marked with the names and logos of other distributors and military organizations. The popularity and superior reputation of Collins edge tools, especially axes, led to a number of competitors engaging in deceptive practices. Deceptive markings applied by impostors appeared on axes as early as 1845. The misrepresented markings were used on and off until at least the first quarter of the twentieth century. They were used by at least three companies right in the United States that didn't even have such a person associated with their respective concern. One company was near Philadelphia. Another company was on the “North River at Napawoch”. (That may have been the Hudson River just above NYC or Napanoch, NY.) The other company was in Humphreysville, Connecticut. Indications are that The Collins Company publicly warned off the domestic transgressors and for a while the problem was under control. Apparently the problem continued. A statement in the 1923 Collins Company catalog solicited information about such frauds and indicated that the information would be held in the strictest confidence. In addition to those who misrepresented themselves by using the name Collins on axes there was at least one legitimate maker who used the name Collins. He was Rufus Stephen Collins of Smiths Falls, Ontario. The working years associated with R. S. Collins are 1851 -1871. His father was Stephen Collins originally from Hartford, Connecticut. Stephen Collins is reported to have been a ship's captain with his roots in Hartford. 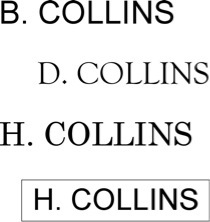 The time frame overlaps that of the beginnings of the original Collins & Co. as well as the Collins Manufacturing Co. No specific relationship has been established to date that but it does suggest that Stephen (and therefore his son Rufus) may have been related in some way to Samuel W. and David C. Collins who also originated in Hartford. Confirmation of any relationship has yet to be verified. Examples of variations of the Crown, Arm and Hammer marking. The more simplified version on the right was used on some axes in the 1940s through the 1960s. There were other modified designs that appeared on other goods especially edge tools that were exported. These representations are of some designs that appeared as part of the trademark on some registration papers. Around the middle of the nineteenth century the problem became untenable as far as The Collins Co. was concerned. It seems the inferior quality of the counterfeit axes was impacting on the Collins reputation. It was determined that a significant number of English edge tool makers, mostly located in Birmingham, were identified as using some version of the Collins name and/or markings. Some were actually duplicating the markings exactly as Collins was marking their goods. The guilty parties were then exporting the goods, so marked, to various markets around the world. Quite possibly because of the expense of suiting all the businesses and individuals engaged in the illegal practice, Collins initiated a suit against a major perpetrator. The matter was heard by a Vice Chancellor who found in favor of Collins. It is understood that the judgement involved forfeiture of all profits from the illegally marked goods along with the destruction of any remaining goods so marked and that any and all improper labels and marking devices also be destroyed. Based on the judgement apparently Collins decided to hold off on suiting the remaining counterfeiters with the provision they cease the illegal practices. That seemed to have worked in England and thereby saved The Collins Co. a great expense in time and money. That doesn’t mean the problem was completely solved. Reports have indicated that a similar practice was undertaken some years later by some German manufacturers but their efforts were squelched upon the threat of vigorous legal actions in the German courts. Despite their legal efforts and the repeated judgments in their favor Collins discovered that apparently the problem continued to a lesser degree. A statement in The Collins Company 1923 catalog solicited information about such frauds and indicated that the information would be held in the strictest confidence. The specific appearance of the markings are believed to have been stampings that looked very much like, if not identical to, the actual Collins Co. markings. Apparently there were no labels involved in the marking of the counterfeit Collins axes. As a result of their experiences with counterfeiters and the like, in 1875 The Collins Co. adopted what was to become a world recognized trademark. The mark was registered in 1876. It consisted of an image of a crown with an arms holding a hammer located above the top of the crown. The symbol had the word LEGITIMUS printed below the bottom of the crown and over a period of time the trademark became known as the Legitimus Mark. 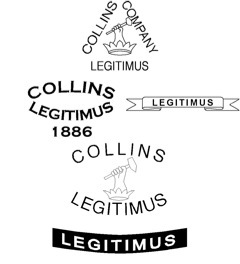 The word Legitimus was used not only on labels and as stampings on various goods that Collins made, it also commonly appeared in published advertisements, on signs, company stationery and in product catalogs in a number of languages. The symbol was even chosen for the castings that were made as snow-catchers that were installed on the company office building in Collinsville. Quite possibly the most common place that the symbol was used was on labels; labels for the American market as well as numerous export markets. Many of the original labels depicting the Legitimus symbol were embossed, a reference to which was even included along the edge of some labels along with the a notation that the label was genuine only if embossed and had been printed by the New York Bank Note Printing Co. Embossing is a process utilized in printing whereas certain areas are raised above the normal surface of the paper. This is accomplished by adding padding under the areas that will be raised and printing on paper that has been temporarily treated to stretch. The earliest trademark reference found, Registration No. 3,406 dated February 8, 1876, that mentioned the word Legitimus actually declares that the trademark is comprised of a "representation of a crown, from which rises an arm holding a hammer." It goes on to read that ... "It is preferred that the word "Legitimus" be shown beneath the crown upon a ribbon with streamer ends: but that is not essential." 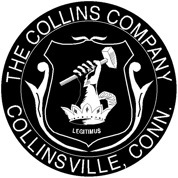 Over the years the combination of the arm, crown and hammer appears to have become the symbol most recognized as being associated with The Collins Company. The symbol, along with substantially the same wording used in the description, was again registered as No. 8,830. That registration was issued on Nov. 15, 1881. The word LEGITIMUS was specifically registered as No. 50,481 dated March 20, 1906. Republication was dated Aug. 17, 1948 and Aug. 17, 1953. 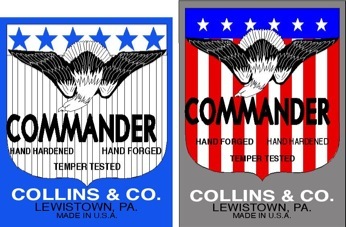 A review of the stampings and labels on which the Crown, Arm and Hammer designs along with the word Legitimus readily shows that The Collins Company utilized those brands and markings in a wide variety of ways. The markings were stamped, etched and or printed on labels. Other variations appeared in advertisements and on company stationary. The end result was recognition conveyed by a number of variations, many of which used individually while still others were adapted to be used in conjunction with other brands. Although the crown, arm and hammer with or without with the word Legitimus was introduced five decades after Collins edge tools started to be made it appears that it became the most recognized and acceptable of the Collins markings. Typical banner as used on labels and in advertisements printed in English. Rufus S. Collins of Smiths Falls, Ontario. 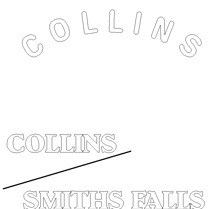 Representation of axe markings where the name COLLINS was stamped on one side or the head and SMITHS FALLS on the other. 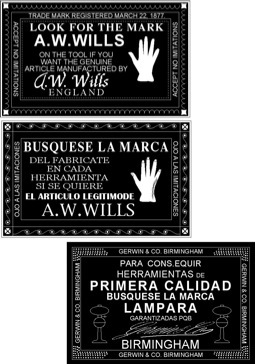 Examples of labels used on Collins made axes for English companies . Collins used a number of brands that were primarily associated with exported goods. The brands were on labels that were registered to Collins but only some of the labels indicated the axes were actually made by Collins. Others may have been made and labeled for distribution by wholesalers or even as alternatives for customers who did not want to pay a premium for a Collins axe or other tool. 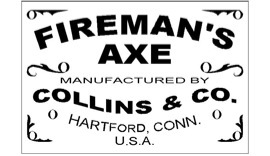 There were a number of other axe manufacturing companies that used labels that had a similar appearance to the black and white labels that Collins used but those labels did not include the name Collins or any of the brands registered to Collins. Facsimiles of axe labels used on goods made by COLLINS and exported to other countries. Earlier Legitimus labels had raised (embossed) lettering around the outer edges. Some were printed with different colored metallic inks. The Crown, Arm & Hammer along with the word Legitimus was etched into one face of some axes advertised to be the best quality made. Markings showing HARTFORD as the location. The number over the curved line indicates the style of a Spanish pattern of axe that was exported. Collins used a variety of stamped markings many of which included a location. It is said that they used HARTFORD on numerous exported tools because it was more recognizable than Collinsville, especially on a map. Markings using Collinsville as the location. Facsimile of marking printed as it appeared in Registration No. 50,481. The outdoor activity that became known as "auto-camping" appears to have started a few years prior to 1920. By the mid 1920s it had become a major past time for thousands of motorists. In answer to the growing demands for certain necessities associated with auto-camping many hardware dealers sold smaller sized axes for cutting firewood and driving tent pegs. This led to the manufacturer of axes with markings indicating they were actually intended for use as a "camp axe". Many were marked according and some even had the words "Auto-Camp Axe" marked on them. Collins & Co. offered such axes. Another term that evolved around that time was "Sportsman’s Axe". Many companies sold axes so marked and some included decorative designs to enhance the appearance of such axes. The popularity of side of the road and back-road auto-camping gave way to the wide spread introduction of motor camp grounds and motor courts as more and more families became involved in such activities. This led to the discontinuance of axes marked accordingly and in their place more and more "Sportsman’s Axes" became available. The Auto-Camp axes and Sportsman's axes were not full sized axes if compared to chopping axes. Some were hatchet size while others were house axe size. apparently they were not meant for chopping larger trees but were more for preparing kindling and spitting wood for camp fires. Fire axes were supplied by numerous axe manufacturers as well as many hardware distributors and fire equipment providers. Most fire axes varied somewhat in shape from those made by other makers but for the end purchaser distinguishing between one make and another was difficult. The majority of fire axes were painted red and Collins chose to use white labels that stood out on the red background. Many Collins fire axes did not have a paper label and many that did also included a stamped marking indicating the manufacturer. On some axes that were identified only with a stamp, Collins used the Legitimus impression while on others they used the name Collins within a rectangular box. Others, believed to have been used in the early part of the 1900s were marked with the name R. King. Marking used on some light weight hatchets. A similar marking without the upper wording was used on some smaller sized house axes. Heavy stamping used on AUTO CAMP AXES. 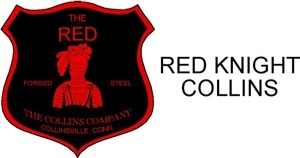 Only one Red Knight paper label design is known along with one style of stamping. Label used on fire axes. The RED SEAL brand was stamped into some axes. The Collins Co. provided some axes to many large distributors who wanted it known that their axes were made by Collins. In some cases both the Collins name and the name of the distributor were on the label. In other cases the name of the distributor was not included. Facsimile of Collins labels that may have only been sold through distributors. The Fleetwood brand was used to identify some axes that were offered through wholesalers. Stamped markings used on various Collins fire axes. • Ron & Virginia White of Angels Camp, CA for their diligent research in providing the majority of the copyright and trademark information including the registered numbers and listings of trademarks. • John Waddell of Reedsville, PA for providing access to the catalog books of Collins Labels. Some conjecture suggests the numbers represented the year but that too is unconfirmed. In some cases the COLLINSNCO. mark was accompanied by the numeral “7” stamped twice above the COLLINSNCO. mark. A booklet on Collins is now available. Please refer to the Home Page for details. The booklet has more information than on this website.